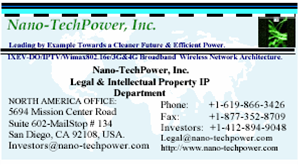 Most updated Nano-Techpower's NewsLetter: July 22nd 2008, Washington DC USA..Please download pdf file here. First, I would like to thank you for visiting our web-site and checking out our progress in this ever changing and evolving technological advancements and one of the wonders of the world. And as we prepare to announce our full executive management by this Fall season of 2008. This first newsletter " news rubrique it's French" is an invitation to all exceptionally bright and outstanding executives and financial experts to join our advisory innovation technology Committee. This committee's central function is to monitor our company progress in Europe and North Africa where we are planning to expand our nanotechnology electrodes with safe and environmentally friendly electrolyte production line. An effort to modernize the existing car battery plant in North Africa to cover a huge market footprint 5 African countries + 5 European countries and to prepare this promising market for future Plug-in Green Hybrid Battery cars. We are excited also to bring o the world our proprietary nano-technology of a wirelessly rechargeable miniature-batteries (Pin-Point engineering accuracy on nano-structured super hydrophobic altered new materials surfaces integrated onto a chip. Combined with the genetically equivalent of a pre-coded pre-set) digital time sequences for efficient power consumptions and near-absolute thermal and material stability for wireless sensors and accurate IC's power management. Our technology is targeting full compatibility and functionality with next generation micro-processors architectures on on new altered materials, and reach new frontiers of the Digital Virtual World above and beyond Moore’s Law limits.new Materials. Nano-technology is expected to be a 220 billion Dollars market seize business investment all applications and industries combined, and part of our daily life within the next three years. As reported by Credit-Suisse bank Nano- Circle Center Market Research. "The Credit Suisse Global Nanotechnology Index was conceived to portray the development of the nanotechnology market as accurately as possible. Since its launch in June 2007, the index has clearly outperformed both the broadly based MSCI World and the Nasdaq Composite technology index (Credit Suisse Global Nanotechnology Index: + 17%, MSCI World: – 4%, Nasdaq Composite: – 3%). 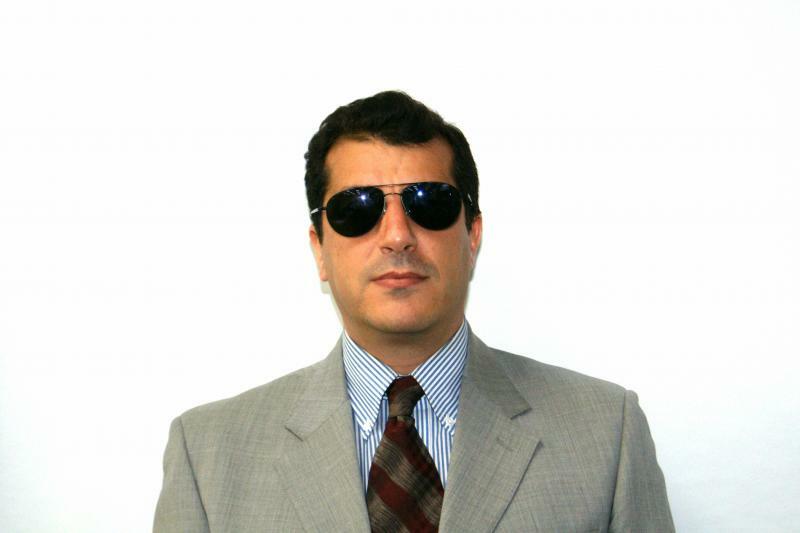 The sub-sectors Nano Energy and Nano Healthcare have been the main growth drivers to date". End of quote [Courtesy Credit-Suisse Bank and its affiliates...published end of June 2008]. Our revolutionary and proprietary nano-technology mentioned above and throughout our web-site and its extended family of product portfolio anticipating a demo release within 18 months and full production lines within 2 to 3 years. Our product line of low-power and different levels of powers of miniature batteries with high density energy and high power density. Targeting the emerging market of wireless sensors which has a diverse and multiple applications and a wide range of industries applications a cost effective approach and varies from : Automotive industry, hyper connective touch screen devices (iPhone, iPod type), smart home appliances, Medical and healthcare monitoring equipments, nano-sensors Food packaging with ultimate safety standards, longer lasting and efficient batteries for advanced Broadband mobile Devices, 21st century Military & Aerospace applications, Oil and Gas field and Ocean explorations, natural climate or man made disasters, earth quakes, tsunamis and emergency recovery operations. The Business operation of the Acquisition of the Battery Car manufacturing Plant in north Africa ( a geo-political and geo-strategic choice over a China Manufacturing plant for anyone curious and wondering Please click here to watch-Youtube_Video...but still we have Asia market in mind). The car battery and its sister unit of stationary telecom batteries and mobile battery pack in North Africa is Nano-techpower's first order of business, and our first priority which requires a lot of work both on the local government regulatory framework, and in parallel a broad extension of a more complex framework which adds an international and an European dimension to address the environmental front and a hot subject which it seems always in a draft format yet strict regulations to be implemented and complied with right away. This operation is run by a consortium led by Spanish investment bank Santander Investment and backed by the European Commission.to meet the strict and always changing new European environmental regulations with other trade regulations in the works. A cost and an effort implications attached to it which are enormous and time consuming. A nano-business card " on my top right" that could be also your next unique global identification card, health condition monitor, 3D Screen GPS locator, broadband communication & entertainment device, select your mobile TV station and watch your favorite show or your business financial show, follow on real-time your global nanotechnology portfolio investment index, and it is your nanoexpress credit card with your accessible retirement plan account all in one, a business and a life depending card; it is customized to fit your personality with atomic level-encryption-security, it can not be replicated, reproduced or stolen. With nano-techpower's proprietary wireless nano-technology sensors with miniature batteries integrated that could locate you anywhere in the world on the same map that is on your business card. And it does not run out of power on you..when you need healthcare emergency assistance either..."A Business Card you do not Give away in a Business Meeting...just send a selective personal information you want to share with your business partner or your life partner!!?"